Everyone's talking about ACEs. But what are the long-term impacts and how can we mitigate against them? ACEs are stressful events occurring in childhood. They have a huge negative impact on how young people learn and take part in school life. There are ten ACEs, divided into three categories: abuse, neglect, and household dysfunction. In a UK-wide study, almost half of the participants had experienced at least one ACE and over 8% have experienced four or more. ACEs don’t just impact on a young person's ability to learn. They create high levels of what is known as 'toxic stress'. Toxic stress is 'the prolonged activation of stress response systems in the absence of protective relationships'. When multiple ACEs are experienced over time, this activates stress response systems in the body such as increased heart rate, blood pressure and the release of stress hormones. You can think of it as a car with the engine revving for days or weeks at a time, putting a lot of strain on the engine. Excessive and long-lasting stress response in a young person can have a wear-and-tear effect on the body. This can then derail healthy brain development, which is thought to have an effect on how someone adapts to future adverse experiences and increases the chance of developing health-harming behaviours (such as smoking). ACEs have a negative impact on social factors of health such as education, employment and income. 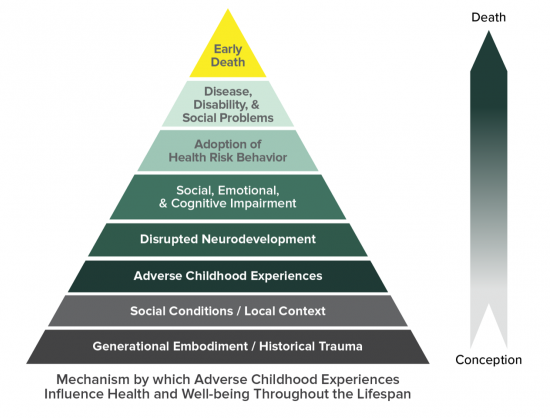 Their strong association with adult health and wellbeing is captured in the ACE pyramid. ACEs also seriously increase the risk of mental illness, with a strong relationship between the number of ACEs experienced and mental disorders. In a US study of 12 to 17-year-olds, mental health problems rose from 11% in children with no ACEs to 44% with exposure to five or more ACEs. Research using World Health Organisation data suggests that stamping out childhood adversities would lead to a 30% drop in the development of mental disorders into adulthood. So what can be done? This TED talk by psychologist Susan Pinker reveals that the secret to living longer is in our close personal relationships and face-to-face interactions. Not everyone who suffers ACEs experience the same harmful outcomes. Research has found that building a relationship with a trusted adult during childhood can reduce the impact of ACEs on mental and physical health. Our brains are shaped by the relationships we have had from birth and therefore impact on our future wellbeing. According to the Scottish Public Health Network ACE report, children who end up doing well despite experiences of adversity usually have at least one supportive relationship with a supportive parent, caregiver, or other adults. This appears to buffer them from development disruption (the kind caused by toxic stress) and builds resilience – the ability to bounce back from serious difficulties. 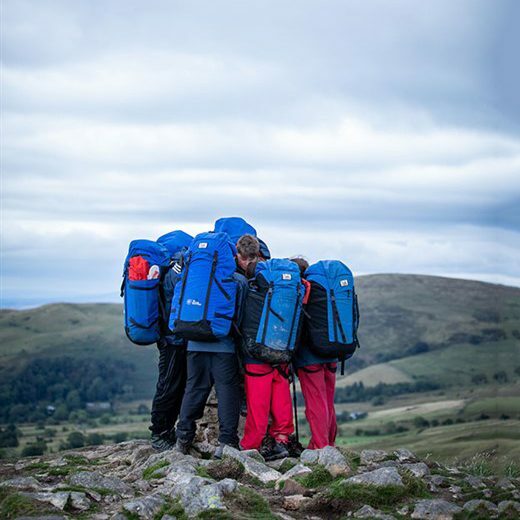 As highlighted by Learning Away research, residential experiences create the perfect environment for developing and enhancing relationships between young people and their teachers, and Outward Bound is no exception to this. 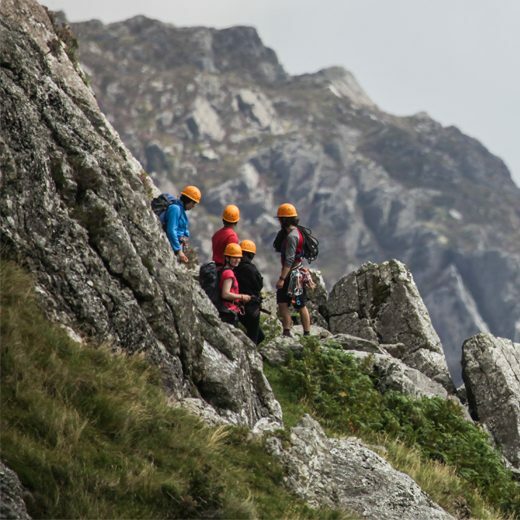 Our courses are all about relationships: with ourselves, our friends, instructors, and the outdoors. We believe the relationships our instructors build quickly and effectively can be extremely powerful. But don’t just take our word for it. 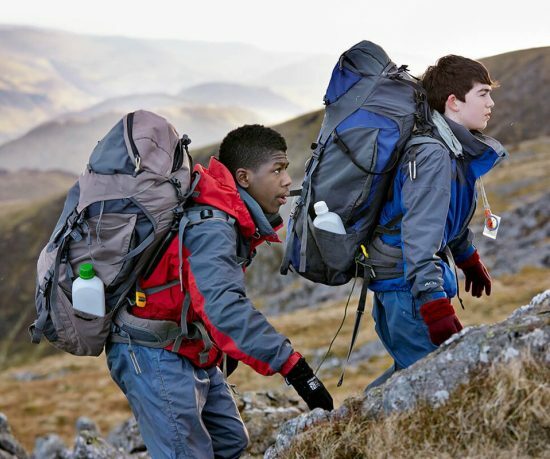 An independent evaluation by Relational Schools, into relational health – the distance in the relationship between two people or organisations - of individuals at XP Doncaster shortly after their Outward Bound course, demonstrated a 20% higher level of relational health compared to the national average. Teachers stated that they had a far better understanding of their students, identifying that this was made possible by seeing pupils in a variety of challenging situations. Students also scored very highly in their knowledge of teachers, showing the reciprocity in the relationships developed through the course. When discussing relationships with their peers, students said that they had developed deeper relationships that also gave a sense of greater cohesion – and here they made the most gains compared to the national average. So there you have it. Relationships are a key resource of resilience for children and a critical protective factor against ACEs. These adversities are a common theme preventing young people from reaching their potential and we all have a part to play in preventing adversity and raising awareness of ACEs. Whilst prevention is our aspiration, taking the first steps toward building trusting relationships with our young people is a brilliant place to start in mitigating against the potentially life-long impacts of adversity. 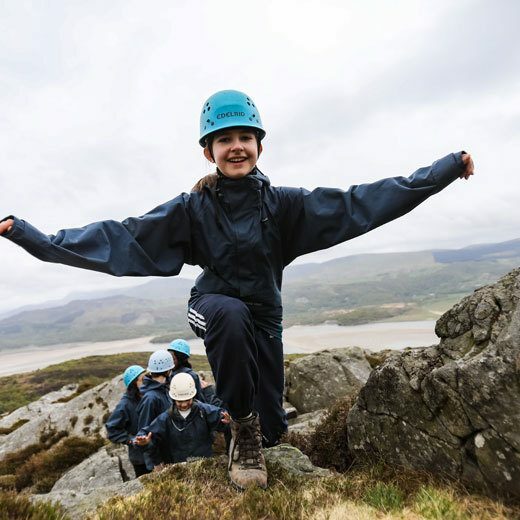 See for yourself how Outward Bound promotes mental health and happiness in young people at our centre in the Lake District. What else can we do to address the decline in pupil mental health and wellbeing? Two teachers give us their views and ideas for interventions.